Another day, another concept car from the Seoul auto show. 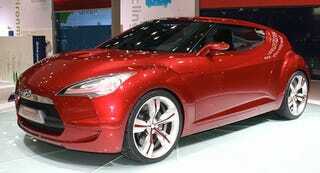 This one is the Veloster, a surprisingly generic product of Hyundai's Design and Technical Center in Namyang. It's powered by a 2.0-liter four from Hyundai's Nanyang-based rally program, hooked to a five speed transbox. No word on what the Veloster might hearken, but it might be some sort of ur-Tiburon related to Kia's Project Snowflake.